Cut 1 potato into even, bite-sized cubes. 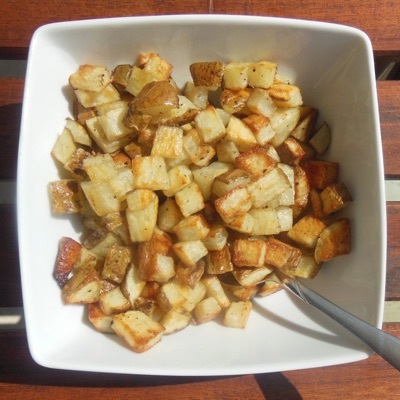 Throw potato in a large ziploc bag or bowl. Mix with 1 TB of oil and salt & pepper to taste. Line a baking sheet with parchment paper, set potatoes on it, bake for 25 minutes or more depending on how crunchy you like them.